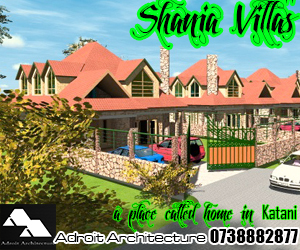 Houses for sale in Kenya done by Kenyan architects often have a familiar outlook when it comes to the way they are built. 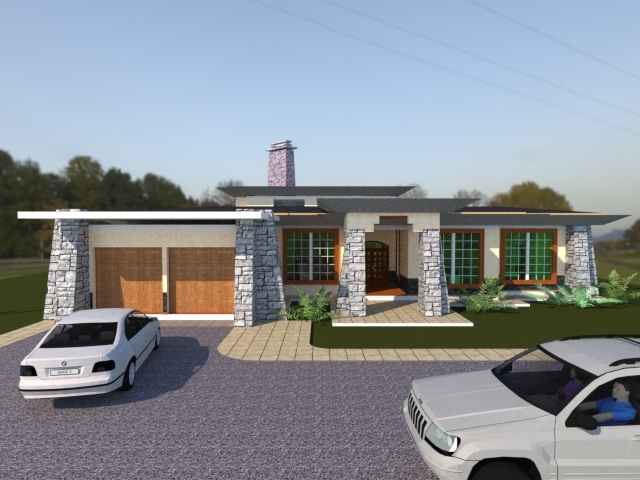 Many residential developments being designed by Kenyan architects have a particular way with which they are done to respond to the requirements of the local climatic conditions, as well as adopt to our systems of building. Indeed many of the housing units so developed in recent times have a pitched roof of some sort as a response to the need for a roof system that drains quickly and easily. However, the question to ask is is that the only way to realize your dream modern home design, especially if you are interested in great modern architecture for the design of your home? 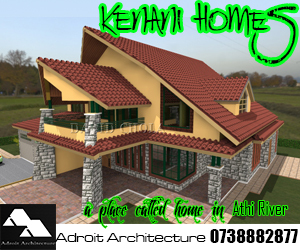 Definitely, one of the most powerful drivers with regard to building design of houses for sale in Kenya is climate, and especially the issue of rainfall and humidity. Its interesting to see how most of our houses today are designed with a pitched roof of some kind. The obvious merit of the pitched roof is that it allows no water to accumulate on it, as any incident rainfall quickly runs off the roof and either drops down to the ground or may be harvested into tanks as part of sustainability initiatives in the home. This also has a further merit of enabling easy maintenance of the roof and ceiling areas as no water can accumulate and stain your timber finishes or seep into the roof structure to cause mould and rot to your structural members within the roof. This notwithstanding, new systems of roofing have emerged with improvement in technology that makes it possible to realize new and novel roof designs having powerful forms and shapes, yet having the benefits of a roof structure that is technically sound and does what a roof is supposed to do. A quick look at the market reveals several products aimed at enhancing roof insulation, degree and duration of remaining watertight, ease of construction, as well as other salient points that roofs need to address themselves to. One of the most important advantages of having a flat roof on a building is the fact that you can make it a functional space that will allow you to use and do activities at that roof area. By virtue of its being flat, a designer can create a usable space for doing things like external relaxation, sun basking and whatever interesting outdoor activities that may be situated on the roof of a building. Of course, the roof treatment must be looked into during construction to ensure that there is no leakage and waterproofing has been sufficiently undertaken. Sustainability concerns can also be taken care of when one considers the design of a flat roof of a building. The roof is one of the surfaces that bring in plenty of heat into a room through the process of conduction. By creating a layer of sufficient insulation, this heat gain with its attendant costs for creating thermal comfort can be taken care of. One way with which such insulation can be undertaken is through the creation of roof gardens. Roof gardens typically entail creating a new flat roof with sufficient structural strength to bear the load of soil and vegetative cover above them. Roof gardens maybe a bit more costly to construct, but once they are done they do offer a strong substrate to create a garden at the top of a building. The advantages of them are enormous especially when one considers their aesthetic appeal as well as their ability to withstand high temperatures getting into interior spaces. Especially in buildings on properties that do not have large grounds, and not much opportunity to create green spaces on the ground level, roof gardens have their place. Especially in urban areas where properties are in high demand and ground floor levels often set aside for commercial uses, it makes sense to create outdoor relaxation area with the use of a roof garden. The design of a flat roof allows the building to take on a very dynamic appearance akin to the appearance of movement. Especially when the flat roof is quite wide in its appearance, it creates a sense of horizontality and dynamism along the horizontal plane. This is one of the characteristics that master architect Franklyn Lloyd Wright used in his design for the Fallingwater House. The interplay of horizontal planes is what gives the building strong sense of character in addition to the varied textures found on the surface of the building. Mixing the two features, that is the flat roof with various projecting horizontal planes, and further contrasting these volumes with the appearance of solid and voids, or strong contrasts of solid and void will allow a great degree of interest in the visual composition of the building unit. Within our tropical region, the obvious disadvantage is that flat roofs are prone to leakages, especially due to the high occurrence of rainfall received in this area. An architect needs to take careful consideration that the design details for flat roof construction must include good specifications for waterproofing, and even during construction, must be correctly laid and fixed according to manufacturer’s instructions. Many of these waterproof membranes may fail with time, and it is a good idea to have them fitted with a UV resistant protective layer above, say such as ceramic or concrete tiles. 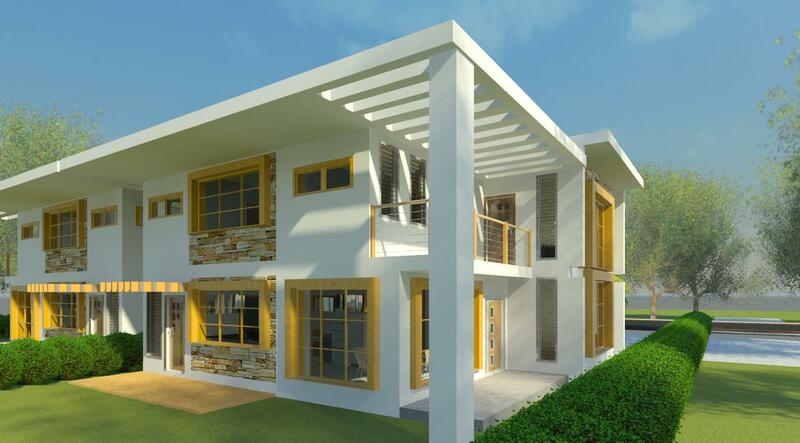 Generally one of the ways in which a building with a great modern-day appearance can be done is the construction of a building with beautiful large openings, and integration of a flat roof. 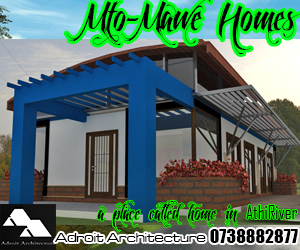 This is one feature that a good Kenyan architect designing modern houses for sale in Kenya can indeed make use of.